In 1789, The French cut the head of their king! Oops! Wrong.... It wasn't until 4 years later that Louis XVI lost his head when he was tried by the National Convention, found guilty of high treason, and executed by guillotine on 21 January 1793. He was the only king of France ever to be executed. The 14th of July has an all-together different meaning, and over the different political periods that came and passed over the last 217 years, the meaning for this celebration has changed and had been slightly modified a number of times. ... in 2010, we continue to celebrate that day for reasons that are surely long forgotten by many people, except may be by the generation of my grand-father on my father side, which by the way, will be 100 years old in December (it will be interesting to ask him what he thinks about that last century and where all this will bring us all...). Come and celebrate Bastille Day at the store (www.HeightsChateau.com) and take advantage of this opportunity to buy the above wines at discounted prices, and why not discuss "Bastille Day" with a glass of French wine to agreement the conversation, which when it comes to the French, always seems to have an underlying tone of rebellious revolution. "Bastille Day" is the French national holiday which is celebrated on 14 July each year. 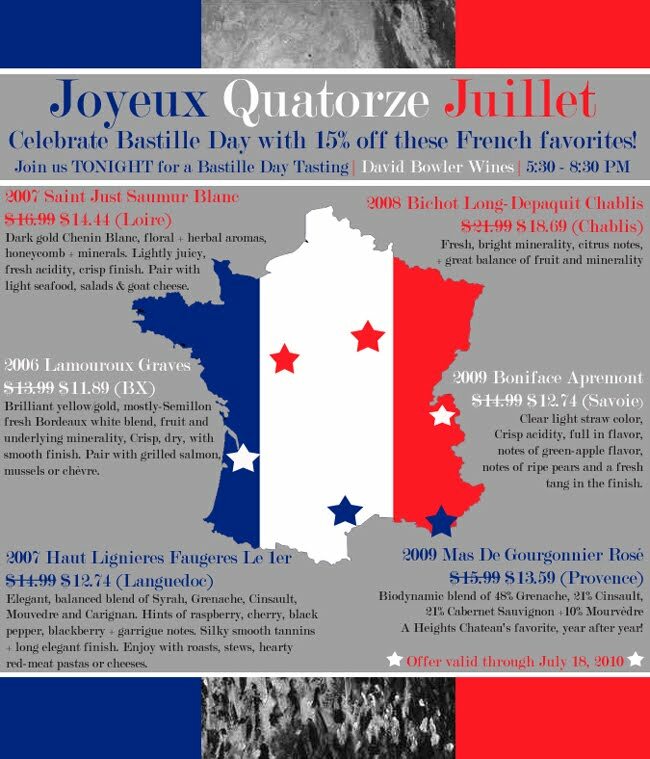 In France, it is formally called “La Fête Nationale” (National Celebration) and more commonly le “Quatorze Juillet” (the fourteenth of July). It commemorates the 1790’s "Fête de la Fédération", held on the first anniversary of the storming of the Bastille on 14 July 1789. The anniversary of the storming of the Bastille fortress-prison was seen as a symbol of the uprising of the modern nation, and of the reconciliation of all the French inside the constitutional monarchy which preceded the First Republic, during the French Revolution. The storming of the Bastille was more important as a rallying point and symbolic act of rebellion than a practical act of defiance. Shortly after the storming of the Bastille, on 4 August feudalism was abolished and on 26 August, the Declaration of the Rights of Man and of the Citizen proclaimed. The Fête de la Fédération of the 14 July 1790 was a huge feast and official event to celebrate the uprising of the short-lived constitutional monarchy in France and what people considered the happy conclusion of the French Revolution. Vive la France, its wines and food traditions and culture, and not to forget the most cliché portrait of the French: a cyclist with a beret, carrying a Baguette, a Camembert, a Saucisson and a newspaper in a little basket on his bike.